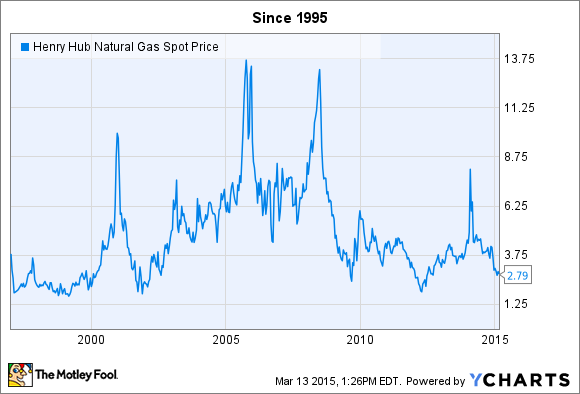 What Happens to Natural Gas Stocks if Cheap Gas is Here to Stay? Natural gas prices are down as much as crude oil. What does it mean for natural gas stocks if this stays the case? Cheap natural gas is great for Americans. What about natural gas stocks? Cheap natural gas is great for the country in many ways. It means lower costs for many of the products we buy; reduced heating and electricity bills; and expanded domestic manufacturing, which provides more good-paying jobs. Conversely, the biggest loser in this game is the companies that produce the gas. Since peaking in 2005 -- and rising nearly as high in 2009 -- the price of natural gas has fallen as output has increased more than 45%. With reserves of natural gas at record levels, and technology making it easier to extract the commodity from the ground, will prices stay low for the foreseeable future? And what happens to natural gas stocks if cheap gas is here to stay? This isn't a simple question. Let's take a deeper look at the industry and see what we can uncover. Diversified industry with few "pure plays"
As a starting point, we need to understand exactly what constitutes a "natural gas stock." The reality is, very few companies are only exposed to the price of gas. For the sake of this exercise, we'll consider a stock "natural gas" if its primary business is producing or storing natural gas, or distributing it from producers to consumers. That means we won't include natural gas utilities, power companies that use gas to make electricity, or producers that focus on oil but produce some natural gas as well. This leaves us with companies including Chesapeake Energy (NYSE:CHK), Devon Energy (NYSE:DVN), and smaller peers like Ultra Petroleum in the producer space, along with pipeline operators such as Enterprise Products Partners LP and ONEOK and its master limited partnership ONEOK Partners LP. While Chesapeake and Devon Energy are two of the largest U.S. natural gas producers, vertically integrated major ExxonMobil (NYSE:XOM) is the largest, and a significant amount of natural gas comes out of the ground along with oil. In short, natural gas is produced by a lot of companies, though only a few focus primarily on this hydrocarbon. Natural gas isn't exposed to international price and demand fluctuations in the way oil is. It doesn't matter how much natural gas Qatar or Russia produce, as the cost dynamics of shipping that product abroad has historically prevented it from being internationally competitive. That means it's almost entirely a domestic supply and demand-driven commodity, and lately our supply is getting a big boost. 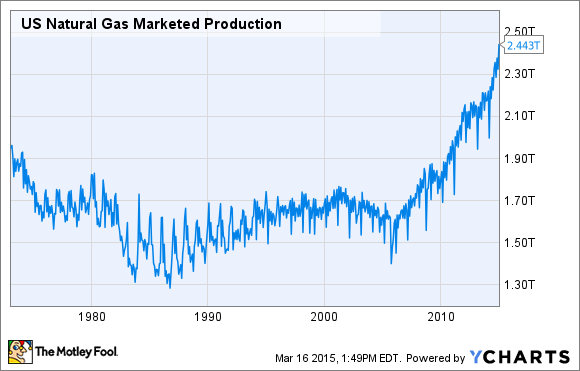 US Natural Gas Marketed Production data by YCharts. As you can see (the yellow line), shale gas wells have been the key driver behind natural gas production growth, but it's worth noting (blue line) that more than 5 trillion cubic feet of natural gas is produced annually from oil wells. That's about 16% of total production -- a not-insignificant amount. As a matter of fact, the U.S. Energy Information Administration recently stated that it expects gas production to rise further in coming months, even as prices remain very low. Let's talk about why. Why is production still growing? When will it slow? Producers have gotten really good at drilling and completing wells, and in getting more production out of those wells. The EIA expects the current backlog for completion of U.S. onshore gas wells -- which it estimates at between three and six months -- to be the main driver behind increased production in the next few months, even with major reductions in active drilling rigs. How much has the rig count fallen? As of March 13, the U.S onshore oil rig count had fallen almost 41% since March 2014, while natural gas rigs have declined 25% since March 2014. As to when production will slow, the best guess anyone can make is "eventually." Rest assured that producers want gas prices to go up, but the economics and mechanics of production mean it takes a long time for reduced drilling activity to impact actual production. As the EIA mentioned in last week's weekly update, the well-completion backlog will drive production up in the short term. Why is this? When a producer has already invested millions of dollars into a well, it is going to complete that well and start producing in order to begin recouping at least some of the drilling costs. This is the stage we are in with both oil and natural gas production. It takes months for capital expenditure cuts in production to reach the oilfields. Where will the growth in demand come from? Demand for natural gas is seasonal due to its use as a heating and electricity-producing fuel, and that seasonality is partly to blame for the cheap prices today. However, the long-term trend indicates demand for natural gas in the U.S. will continue growing over the next decade. After all, natural gas serves a lot of purposes beyond feeding power plants and heating your home. This includes being a major feedstock for the production of ethylene, the most commonly used organic compound in chemical manufacturing. Ethylene is used to produce literally thousands of products, ranging from packing material to plastics to detergents to fabrics. Cheap American natural gas is been one of the biggest drivers behind investment in expanding domestic chemical manufacturing. According to the American Chemistry Council, chemical manufacturers will invest more than $125 billion in new projects in the U.S. over the next decade, specifically because of cheap natural gas. Natural gas's use as a transportation fuel is also growing, as is its viability as an export, as has been demonstrated by Cheniere Energy (NYSEMKT:LNG), which is building liquefaction and export terminals in Louisiana and Texas that are set to begin major exports later this year. Both of these will increase demand, but they are also based on the economics of U.S. natural gas staying relatively cheap compared to alternatives. In the case of exports, domestic natural gas must remain significantly cheaper than other sources in the target import markets, which are largely Europe and Asia. For transportation, natural gas must remain cheaper than gas or diesel to continue to grow as a vehicle fuel. At the end of the day, natural gas prices will probably continue to fluctuate, but this is more a product of the fact that it can take months for production increases or decreases to impact the actual supply and demand balance. Furthermore, new production methods continue to reduce production costs, meaning cheaper gas can still be profitable. To reemphasize, gas prices aren't influenced by global output in the way oil is, so domestic producers can bring production levels more in line with demand, and the market will find an equilibrium for a time before the next big shift in demand drives prices up or down again. Natural gas stocks are likely to remain quite cyclical, and in a few months people might be asking, "will gas prices ever go down again?" As much as it might seem otherwise, the situation is not necessarily any different today than it was 20 years ago in that regard. If you're going to invest in natural gas stocks, you must accept these "boom and bust" cycles, and you need to stay informed about the industry, demand, and how macroeconomics can impact demand. Prices can move quickly. After all, just about one year ago many in the industry were expecting gas prices to climb, with gas reserves at some of the lowest levels in years. Needless to say, record production levels kept that from happening. To paraphrase Warren Buffett, invest in the best companies, focusing on getting a fair price for them, versus shopping for bargain-bin specials that might be poorly operated. The best-run companies can survive the downturns, and often use it to their advantage and come out stronger, while their peers ignore the warnings signs and get caught with too little capital and too much debt when things get tough. If you're not willing or able to invest the time in researching the producers, the midstream operators are probably a better place to invest, since their business isn't based on gas prices, but the "toll-booth" fees they collect under long-term contracts to move oil and gas products around.